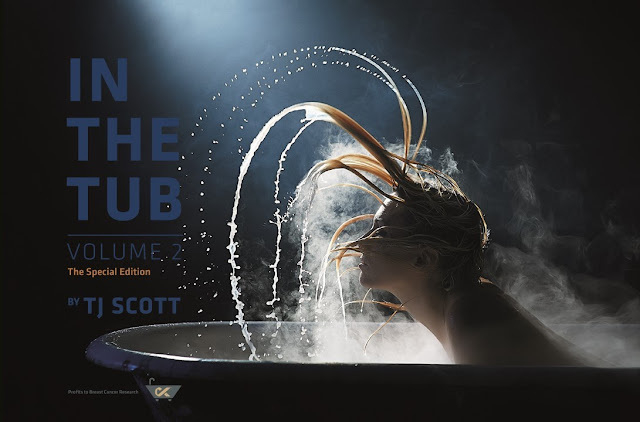 TJ Scott has waged his own war on Cancer by creating this visually stimulating new book IN THE TUB VOLUME 2 featuring 160 actors, musicians and celebrities in stunning imagery, all in The Tub. Profits of the book sales go directly to raising breast cancer awareness. Content from Cinematic Pictures Group. Award-winning TV director TJ Scott decided to wage his own war on Cancer by raising funds after his Mother’s third round of Breast Cancer found its way to her bones & lungs. He donated his artistic eyes and all of the actors, musicians & celebrities donated their time to this title created strictly to raise funds for breast cancer research and awareness. TJ Scott has been leading the way in cinematic imagery in television for over 20 years. A few of his awards and nominations include winning the CSA award as best director for Orphan Black, five Gemini Award nominations for his TV feature Deadliest Sea, and numerous wins and nominations of Golden Reel Awards on the ground breaking series’ Xena: Warrior Princess, Hercules: The Legendary Journeys, and Young Hercules. His episode of Playmakers, “The Piss Man”, was listed by the American Film Institute as one of the Top 10 episodes of television of the year. His recent TV work includes directing the hit series Star Trek, Gotham, Bates Motel, The Strain, Longmire, Black Sails and Spartacus. Scott also serves as an executive producer on the award-winning web series ”Teenagers” (2014–present). After T.J. Scott’s mother’s third round of breast cancer found its way to her bones & lungs, he has waged his own war on Cancer and is using 100% of the profits from In The Tub vol 2 for breast cancer research and awareness. 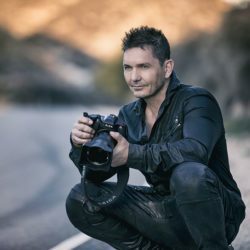 Over 30 years of experience in the entertainment industry, film and television director, screenwriter, producer and former stuntman, T.J. Scott, has crossed over into the world of print with Volume 2 of the coffee table book, In The Tub. As an acclaimed photographer, this book features beautiful photos of many of the actors he has directed. In The Tub vol 2 further journeys into T.J. Scott’s creative visual spectrum presenting a beautiful book full of beautiful men and women captured in understated settings. The book is filled with Musicians, Actors, Artists and Model simply lounging in a bathtub. Readers will get to see a totally different side of these people in the most artistic way. 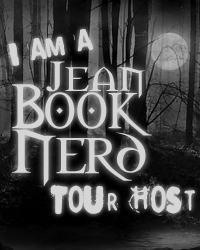 The JeanBookNerd Team was in attendance at the Red Carpet Event for In The Tub vol 2 and interviewed several people including musicians Kim & Scott Collins, actresses Tricia Helfer & Vanessa Cater, the author T.J. Scott and many more. JBN has the exclusive on their experiences with the project and what the book’s main purpose means to them as they band together to fight against breast cancer. The JBN Team during Red Carpet. Erik (Videographer), Jade (Journalist), Americo (Journalist) and Ed (Videographer). All photos owned by JBN unless noted. Abigail Ratchford, Agatka Waclawska, Alex Appel, Alex Bloch, Alexia Fast, Aliyah O'Brien, Allison Brennan, Amie Barsky, Anastasia Griffith, Anastazia Dalesandro, Andrea Bogart, Andrea Drepaul, Andrea Jensen, Angelica Cela, Angelica Celaya, Angie Savage, Areayl Cooper, Arlene Tur, Ashleigh Harrington, Ashley Joncas, Ashlynn Alexander, Astrea Campbell-Cobb, Atoosa Zia, Avery Rose, Beatrice Brigitte, Bianca Haase, Bo Roberts, Bobbie Phillips, Brit Bliss, Carin Moffat, Carlton Gebbia, Caroline Correa, Cela Scott, Chandra West, Chanon Finley, Charlene Amoia, Charlotte Fantelli, Chelan Simmons, Christina Cox, Christopher Mesmer, Courtney Bacon, Crystal Chappell, Dan Feuerriegel, Dayle Mcleod, Dean Cain, Deborah Dir, Deborah Odell, Devon Weigel, Ditch Davey, Dre Davis, Drew Scott, Ellen Hollman, Emily Coutts, Evis Xhenti, Free Dominguez, Georgia Jauslin, Gwendoline Taylor, Holly Dewan, HRH Princess Theadora, In The Tub, Isis Ou, Jacinta Stapleton, Jacqueline Honulik, Jaime Slater, Jamie Van Dyke, Jasmine Jardot, Jason Hassell, Jena Sims, Jennifer Krakowski, Jenny Cooper, Jessica Harmon, Jessica Hinkson, Jessica Huras, Jewel Staite, Jinxx Ferguson, Jonathan Scott, Jud Tylor, Juliette Beavan, Kachina Dechert, Kaitlyn Leeb, Katherine Bailess, Katie Boland, Katrina Law, Kelly McCormack, Kim Collins, Kris Holden-Ried, Krista Madison, Kristian Brunn, Kylie Lewallen, Kylie Shea, Lara Jean Chorostecki, Laura Colquhoun, Laura VanderVoort, Lauren Compton, Lauren Lee Smith, Lauren Shaw, Lexa Doig, Lexie Galante, Lili Borden, Liz Primo, Lola Miche, Lorea McFarlen, Louise Griffiths, Luciana Carro, Luciana Faulhaber, Luna Rioumina, Lyndon Smith, Madison Nazzarette, Malina Moye, Marie-Luise Vielhaber, Matt Huston, Maxine Huy, Megan Blanchard, Meghan Heffern, Mikaella Ashley, Mishael Morgan, Monika Schnarre, Murielle Telio, Natalie Gauvreau, Natalie Halcro, Natalie Loren, Nawal Bengholam, Neraida Bega, Nicky Whelan, Nicole Williams, Olivia Pierson, Patricia Mckenzie, Porscha Coleman, Rachel Hayward, Rachel Skarsten, Rachel Wilson, Rachele Royale, Reanin Johannink, Renee Pietrangelo, Ricky Whittle, Roger Cross, Sam Kong, Sandy Sidu, Sarah Carter, Sarah Jurgens, Sarah Scotford, Sarah WIthers, Satu Runa, Scott Collins, Shannon Kook, Sharon Taylor, Sibongile Mlambo, Sidney Leeder, Sophia Davey, Sophia Pierson, Stef Dawson, Stephanie Chalmers, Stephanie Gonder, Summer Watson, Tamara Duarte, Tara Yelland, Thyme Lewis, Tricia Helfer, Vanessa Cater, Vinessa Antoine, Xhoana Xheneti, Zach McGowan, Zara Durrani.